At Seahawks headquarters, the Virginia Mason Athletic Center in Renton, Washington, Jeff Richards dreams up new ways to get fans excited about their team. Jeff Richards ’02 remembers the exact moment that first set him on a path to the Super Bowl. The Seattle Pacific University Falcons were hosting the men’s NCAA basketball regional tournament. Working for then-Athletic Director Tom Box as a student assistant, Richards had been tasked with promoting the Falcons’ playoff game, to make sure the stands were full. They’d succeeded, and hundreds of screaming Falcon fans were watching their team win and make the Elite Eight tournament round. 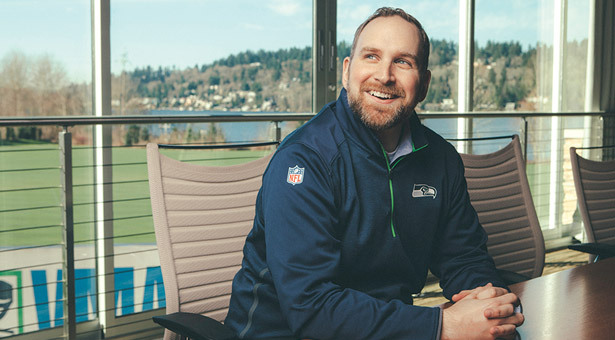 Now, as managing director of marketing and brand strategy for the Seattle Seahawks, Richards is all about bringing in football fans. Whether it’s a longtime season ticket holder or someone who watches every game with a group of friends in Alaska, Richards’ goal is that each fan is having a positive, game-day experience. He points out that the Seahawks are the only NFL franchise in history who have ever retired a jersey number in honor of the fans — No. 12, of course, for the “12th man,” the loud and proud fans whose cheering sets off earthquake-level seismic waves when touchdowns are scored at CenturyLink Field. 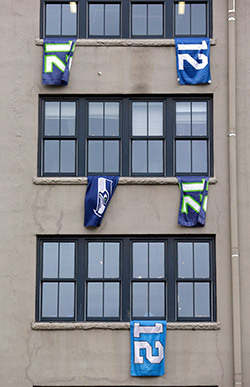 Raised at the beginning of Seahawks home games since 2003, the 12 flag can be seen flying around the Pacific Northwest. The 12s have been key to Seahawks fan culture for many years, but Richards believes the current team, under the direction of Coach Pete Carroll, has raised the “12” flag even higher. To support positive fan engagement, Richards has taken on all kinds of projects. He got giant “12” flags raised on the exterior of the Virginia Mason Athletics Center, the Hawks’ training facility in Renton, Washington. He launched a #WeAre12 social media campaign, encouraging groups of fans to share photos of themselves celebrating “Blue Friday” in their Seahawks gear. Submissions poured in from all over the Northwest and beyond. “We have the biggest land territory of any NFL team,” Richards says. Of course he knows that fan support from Montana, Alaska, or British Columbia isn’t necessarily automatic. Sure, winning the 2014 Super Bowl boosted fan support. And losing the 2015 Super Bowl in a few nail-biting seconds does sting a bit. But Richards takes the long view of the big wins and the big losses.